And yes there are times when the first draft doesn't actually eventuate...the idea peters out before the story is told. Or if I'm more honest, I lose my excitement. But once it is written...and left to percolate, hopefully for at least two months...then it is time for the hard work. I find this very boring and horrid because I am not a planner. I am more a seat-of-my-pants kind of writer. I'll begin with an idea or an image, sometimes only a vague character...and the Nanowrimo novel that I wrote a few years ago began with the thought 'what if all I had known about my mother was a lie.' I had no characters, no plot, no plan....just a phrase and I wrote blindly from there. So for me the second draft is hard, hard work. I print it out, (always best to have a hard copy) take out a pen and read it from start to finish. I do mark any typos or spelling mistakes I pick up but also I circle sentences that appear clunky, words that just don't sit right. I will rule out whole paragraphs, query chapters....question whether this or that makes sense. First of all---is there a story being told? Sounds simple but sometimes I fear we are too caught up with being clever and being a WRITER that we forget that there has to be a story in there. Then I look at my main characters...are they believable...are they constant? Do their eyes or hair change colour? Are they weak...interesting.....are they worth being in there? Is the dialogue jarring? While looking at characters it's always good to rethink names. Sometimes we fall in love with them because they call to us - but can anyone else pronounce or even spell this name? 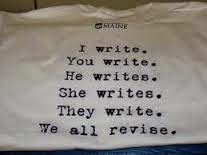 Or is your novel featuring fourteen characters called Mark, Marlene, Matty, Max, Marcus, Michelle, Mikhaila, Mickey, Mike, Missy, Minx, Mandy, Maude, and Minnie- making it so difficult for anyone to remember who said what to whom and why. This is why I don't enjoy the second draft- because it is all about working hard. There is no time for a rush of words, for that excitement as I write into the darkness. Not knowing where exactly I'm going, but willing to go along for the ride. 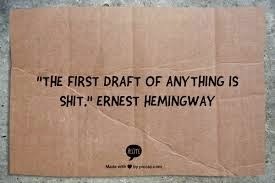 Which explains why I also don't enjoy the third draft, the fourth draft, fifth, sixth .......as many as it takes. Perhaps if I was more of a planner when I began a project, I wouldn't have to do so many drafts. But I don't think it hurts anyone to go over their work with at least a few of these suggestions in mind. 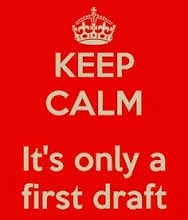 So enough of this writing blindly for fun....time for some hard work and get into the second draft.